One April 16, 2004, the Red Sox unveiled the Ted Williams Jimmy Fund statue outside the Gate B entrance to Fenway Park at the corner of Ipswich and Van Ness Streets. Crafted by sculptor Franc Talarico, the 1,200-pound, eight-and-a-half foot tall statue depicts Williams (521 career homers) placing his hat upon the head of a young boy with cancer. it is a testament to the half-century of public appeals the late Hall of Famer made on behalf of Dana-Farber Cancer Institute and its Jimmy Fund — the official charity of the Red Sox. 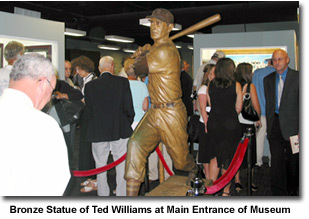 On February 28th 2007, Red Sox Legend Johnny Pesky (a Red Sox teammate of Williams 1942 and ‘46-’52) led a delegation of Red Sox and Lee County (FL) officials in the unveiling a statue, which is a duplicate of the one that stands at Gate B outside Fenway Park, and proclaimed the surrounding area "Ted Williams Plaza." Located at the Park entrance at the corner of Edison and Broadway, the statue was donated to the Red Sox' Spring Training home by Dave McCarthy of the Ted Williams Museum and Hitters Hall of Fame. On April 10, 2006, the Ted Williams Museum & Hitters Hall of Fame found a new home on Baseball Alley inside the Tampa Bay Devil Rays Tropicana Field. The museum had previously been located in Hernando, a few blocks from where Williams himself lived during his later years. The added traffic of fans attending the games will result in even more interest in the Ted Williams Museum & Hitters Hall of Fame, a new 7,000-square-foot upstairs wing that will highlight Williams' life by decade, as well as serving as the home for the Hitters Hall of Fame. As you walk in the main entrance, you can't help but notice the bronze statue of Williams standing in the on-deck circle, along with a tribute to Williams’ military service, and a collection of photos that once appeared on a wall of the Prudential Building, directly across from Fenway Park in Boston.